Discussion between Rich Bruckner of insideHPC and Michele De Lorenzi at the hpc-ch booth during ISC15. Join hpc-ch and CSCS at ISC15 exhibit in Frankfurt at booth #810. 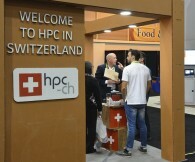 You will hear about the latest HPC news from Switzerland and get some chocolate and coffee.